Breville BES870XL Barista Express Espresso Machine Review! 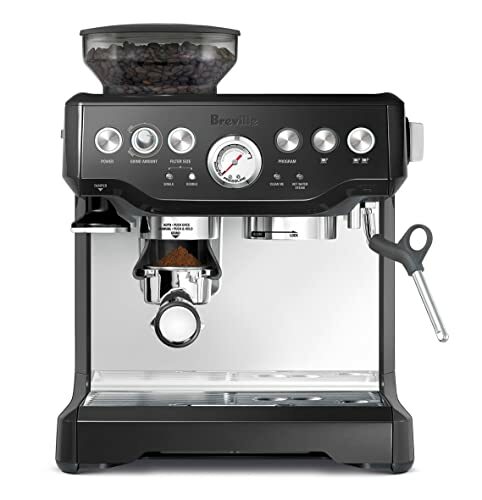 The Australian-made Breville Barista Express Espresso Machine offers customizable dependability. With clear settings and reliable design, you can enjoy the perfect cup time after time. The sleek, impressive design will instantly transform your kitchen into a sophisticated café and yourself into a chic barista. III. Why Do Owners Love the Barista Express? IV. What Would Owners Change About the Barista Express? V. Who Should and Should Not Buy the Breville Barista Express? This espresso maker is perfect for anyone who’s interested in becoming a proficient barista but lacks the patience or inclination to navigate a panel of confusing dials and knobs. The simplicity of the Breville Barista Express allows you to easily create a customized shot of espresso. The handy adjustments allow you to create the perfect shot for your particular taste. It’s a happy medium between hopelessly complex and completely ho hum. Unlike many home espresso machines, the Breville Barista Express offers its own conical burr grinder so you can enjoy the freshest espresso possible. The hopper is moderately sized, which will help you remember to remove unused beans and store them in a closed container rather than in the hopper as you might be tempted to do with a larger grinder. When making espresso, using freshly ground beans is a must. Also, you really need to be able to personally control the size of the grounds. With this machine, it’s a snap. Simply program the volume of the grind for either a single or double shot. If you’re especially ‘spresso-savvy, you can customize the volume for your own personal taste. Light coffee requires smaller grounds than do darker beans. That’s because darker beans contain more surface oils, and introducing those flavors into the coffee happens quickly. Light roasts require smaller grounds. Although water flows more slowly through the close-packed grounds, it comes into contact with more surface area and thus acquires the flavor nicely. Knowing the complexities of which roast requires which ground size will go a long way to helping you create the perfect espresso. It’s something that takes time and practice, so don’t be afraid to experiment. Not only does the dose control and grinding adjustment allow for easy control and consistency, but the brewing process itself also is easily mastered for a consistent brew. The Barista Express is equipped with digital PID temperature control so that you don’t have to guess. This allows you to make a consistent espresso time after time. The pressure gauge shows you the exact extraction pressure, and if you always stop it at the same spot, you’ll have even better consistency. 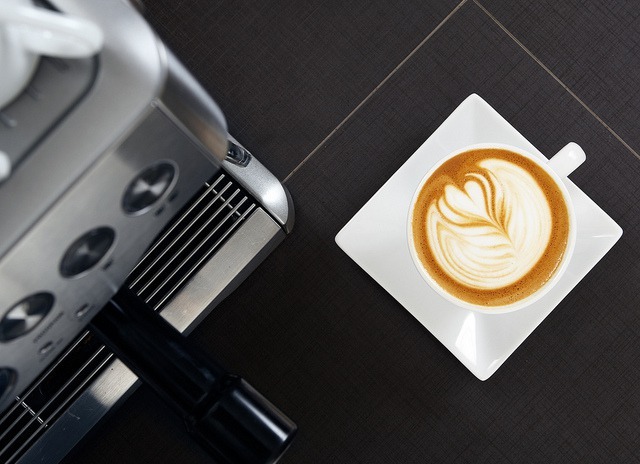 The steam wand allows you to create beautiful lattes and cappuccinos. The purge capability allows you to avoid accidentally adding water to the milk. The Breville Barista Express comes with everything you’ll need to make a great shot of espresso. From a classy milk pitcher to the toasty mug warmer, you can see quickly that this machine was made by a genuine coffee lover. 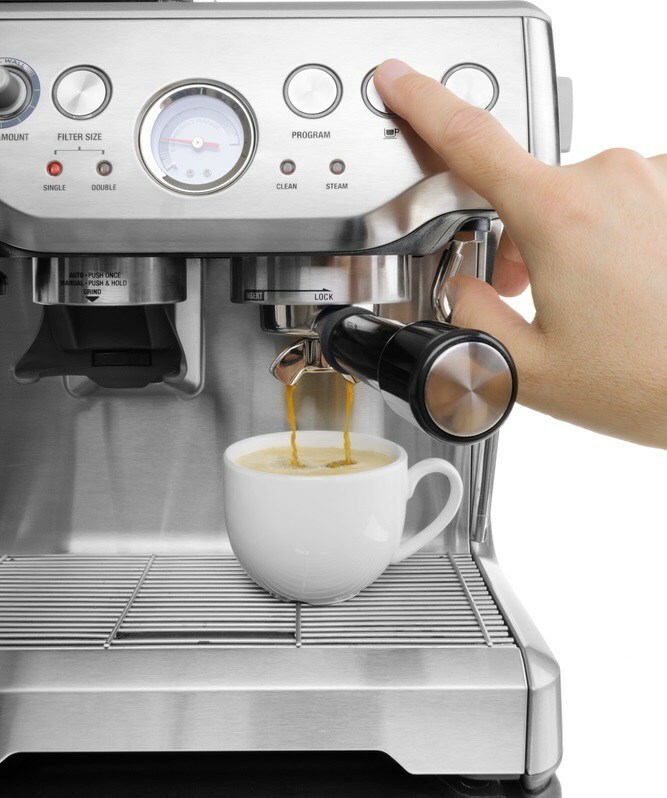 When you’ve selected your brew, when the machine needs to be cleaned, or even when it’s overheated, the Breville Barista Express Espresso Machine will alert you with attractive lighted buttons. The pressure gauge on the front of the machine shows you whether the water is in the pre-infusion stage, preparing the grounds for extraction, or whether it’s reached full extraction and is finished. The dedicated water spout is perfect for heating cups or for filling a cup two thirds full for a long black. 2. Easy operation and consistently great espresso. 4. Includes all accessories and tools you could need. 1. Overflowing portafilter constantly makes a mess. 2. Drip tray fills quickly. 3. There is a learning curve. 4. Returning and replacements can be difficult. To make a cup of espresso, you fill the grinder with your favorite roasted coffee beans. 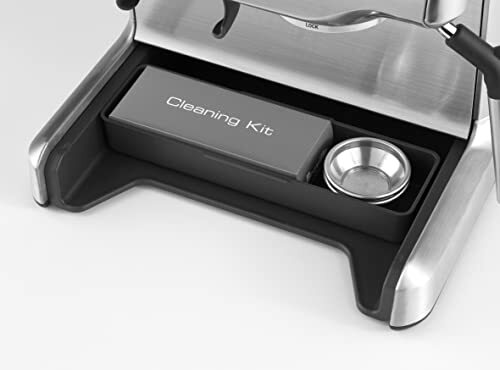 Don’t worry about the amount – if you don’t use all the beans, you can remove the hopper and pour the beans back into your vacuum-sealed container quite easily. Using the dose adjustment, decide whether you’d like a double or single shot. Also decide what size ground you’d prefer. Insert the portafilter into the grind cradle and simply bump it to start the grinding. The machine will automatically cut off when the fragrant mound of grounds is high enough. Carefully remove the portafilter from the grind cradle. With your hands, gently distribute the grounds evenly over the filter insert. Gently tap it against the counter to collapse the grounds, and then tamp it with the included tamper. Add enough pressure to make a neat puck, but don’t worry about over-exerting yourself. You can then use the Barista razor presize dose trimming tool to exactly control the extraction rate by delivering just the right dose. Once the grounds are tamped sufficiently, replace the tamper into its magnetic holder. Insert the portafilter into the machine for immediate brewing. Fresh grounds are a must for great espresso, so don’t waste time about it. Inside the machine, a pre-infusion stage gets your grounds perfectly prepared for extraction. In seconds, you’ll see that the pressure has already built, and if you take care to always stop the machine when the pressure reaches the same point, you can be guaranteed a consistent brew every time. As the espresso reaches perfection, you’ll see perfectly viscous dark flows pouring down in double spaghetti-sized streams. The machine quickly transitions to steam. Using your included stainless steel milk pitcher, fill it to the V with cold milk. Once the steam has built, pause the steam and insert the steam wand into the pitcher. Turn it back on and allow the steam to stretch and texture the milk, adding microfoam bubbles until the milk is the texture of wet paint. Once the milk container is too hot to hold barehanded, it’s time to add the milk to the espresso. Keep practicing until your latté art skills match any barista, and until then, just enjoy your perfectly prepared homemade espresso. Ever since espresso was first invented at the turn of the twentieth century, it has captured the hearts and minds of generation after generation. The idea for espresso first came from observing steam trains. Surely if water could be forced through coffee grounds with enough pressure, the caffeinated result would be as earth-shaking as the locomotive. After the invention of a spring and piston design, espresso took off – especially once the shortages of World War II were only a distant memory. From Italy the espresso craze swept the world, and it’s still gaining momentum. For many coffee lovers, the beckon of the café promises energy and stimulating discussion. For others, the pull of espresso is so strong that waiting in line at a coffeehouse isn’t enough. What they need is a café on the kitchen counter. 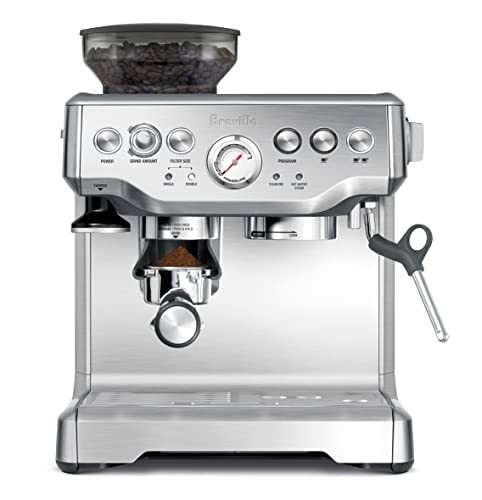 The Breville Barista Express Espresso Machine offers that easy access to consistently great espresso. I hope you’ve enjoyed this Breville Barista Express review. In this Breville 870xl review, we’ve looked at the features of the machine. Also in this BES870xl review we’ve talked about how you can make a perfect shot of espresso.